I think it's rather interesting that Hamilton introduced "new" models in the 1950's that seemed to be inspired by previous models from the 1940's. A while back I did a post on the 1939 Brock. It's a 14K watch that was made through 1952. 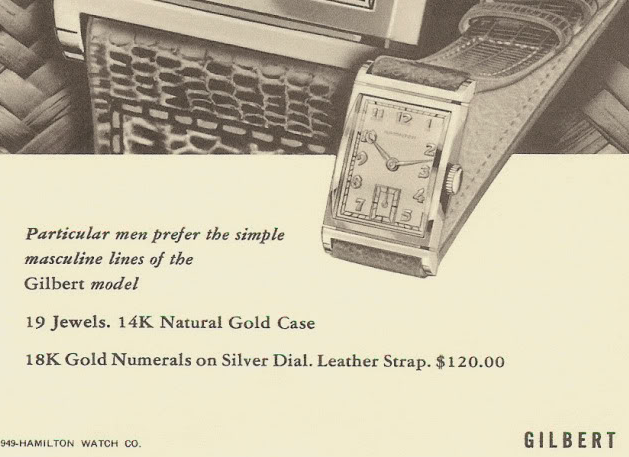 In 1953 a very similar watch in 10K was introduced - it was called the Brockton. You see Brocks and Brocktons for sale all the time. A less common pairing is the 1946 Gilbert in 14K and the 1953 Gilmore. The Gilbert was made until 1951. In 1953 the Gilmore was introduced, but in solid 10K. It was only available for one year. The Gilmore looks a LOT like the Gilman, although the Gilmore is a little bit larger since the 12/0 sized 754 movement inside is wider than the 14/0 sized 982M in the Gilman. 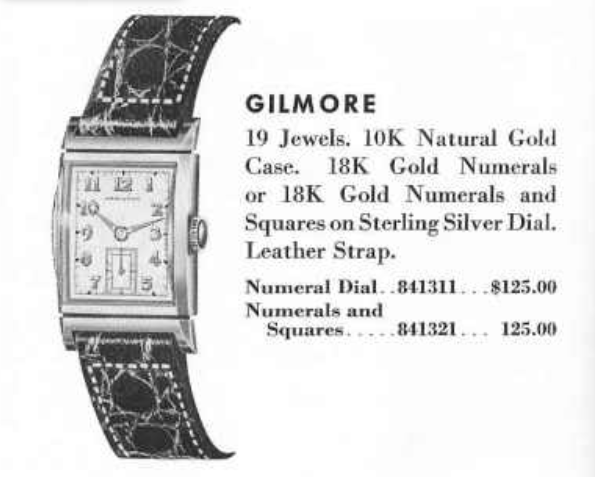 The Gilmore features a sterling silver dial with solid 18K numerals or 18K numerals and squares on an optional dial. The 19 jewel 754 movement is a "medallion" movement like the 982M. It's basically a higher grade version of the 19 jewel 753 movement... which replaced the regular 982. The 980 was replaced by the 17 jewel 12/0 size 752 movement. All three 12/0 grades were replaced in 1955 by the 22 jewel 770 movement. Since the Gilmore was only made in 1953, you should expect to see a 754 inside. If you happen upon one with a 770 inside, you'll know it's not original to the watch... not that it should matter much to you, unless you are a true purist. I recently snagged a Gilmore and to be totally honest, I thought it was a Gilman with an incorrectly refinished dial. If you look closely the seconds sub register differs slightly between the two models. I figured, "Oh well, I'll just get the dial redone to look original". However, then I realized it was, in fact, a much less common Gilmore, with the correct dial. As received it was rather dirty and the crystal had some minor issues - especially in the corners. The strap was a rather cheap chinese leather of some sort - so that will have to go. A fine watch like this deserves something from the reptile family, in my humble opinion. The watch case is rather crisp. The back has a brushed look - and that's what they looked like when new. Whether this is original or not, I don't know. But it's definitely in great shape. Without the crystal in the way, I can tell that the dial is original and in great shape. Hopefully some of the markings from the glue on the crystal will come off. The 754 movement has a dull haze over it - an indicator that it hasn't been cleaned in quite some time. I think it's interesting how the enameled printing is orange - that's to indicate the "gold status" of a medallion movement. It makes it rather difficult to read though. Sometimes Hamilton marked in the inside of the case back with the model name - but most of the time that's not the case (pardon the pun). The serial numbers inside the case back don't really mean anything when it comes to identifying models. They can be helpful though, in guestimating how many watches were produced... assuming you can collect enough examples. 12/0 model movements can often be a little tricky. Depending upon the contour of the dial, they may include a spacer plate. Seems simple enough, I know, but anytime I reassemble one of these watches I always have to think, "Exactly how does this plate go back on again?". I took this photo partly so I could refer to it later, and also to show you it, thus killing two birds with one stone. While everything "cooks" in the ultrasonic, I'll prep the case for a new glass crystal. The haze is now gone from the movement and the balance is happily purring away. Now the movement goes onto the timer to see how well it's running. Not bad... 6 seconds fast per day, good amplitude and acceptable beat error. Everything goes back together, including the spacer plate (I'm glad I took that picture...). A new genuine lizard strap completes the restoration and a fresh glass crystal makes everything look tack-sharp. The crystal on the Gilmore and the Gilman is supposed to be domed, like this. It give the watch a nice look and it protects the case from wear too. This turned out to be a great looking example! I just received a Gilmore as a gift from my wife. The back case is very lightly brushed. It came in the original case with booklet, all in the original Hamilton cardboard box with the build sheet attached, even the original owners name, as it was a corporate gift. Pretty cool -- as is your site. This is my first Hamilton, it will not be my last -thank you for the information.